Virginals – rectangular harpsichord (Muselaar version – keyboard on the right-hand side). 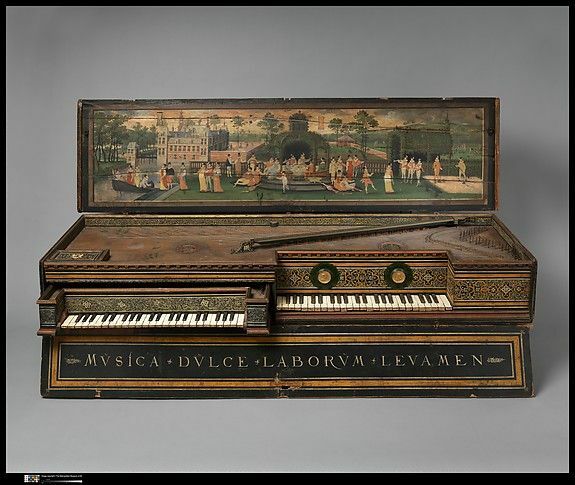 The collection of the Metropolitan Museum, New York, includes a Virginals, dated 1581, by Hans Ruckers – the first of several generations of Flemish harpsichord makers in Antwerp (Belgium). The instrument had been exported to Peru (Nueva España) in the late 16thc; likely specially commissioned by/for a musician in colonial service. It was discovered in a hacienda chapel in Cuzco, Peru in the early 20th century in remarkably good condition considering its age and the effects of the tropical climate. Spain and Portugal introduced European music into their respective South American colonies starting in 16thc. for primarily liturgical use. Later, the European style became blended with indigenous music, language, and instrumentation. Martín y Coll, composer and organist, his modern fame rests on four volumes of the Flores de Musica (Musical flowers), a compilation of hundreds of keyboard pieces, nearly all of them without an author. Gaspar Sanz, 1640 -1710, composer, guitarist, organist and priest. He wrote three volumes of pedagogical works for the baroque guitar that form an important part of today’s classical guitar repertory, and have informed modern scholars in the techniques of baroque guitar playing. Sanz’s manuscripts for baroque guitar are written as tablature.